If you thought Elon Musk was smart, you haven't met his alternate Twitter personality - Bored Elon Musk. 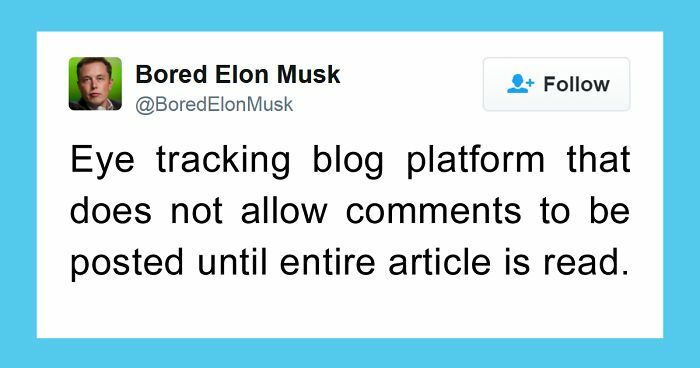 Self-described as a "futuristic hyper-parody account," Bored Elon is so clever he almost hurts our brains. The sarcastic, witty, and often ingenious account has drawn in over 1 million followers since its creation in 2013, though the true identity of the user behind it remains unknown. Bored Elon Musk may not be the CEO of any major corporation, but he sure has some damn good ideas on how to make life easier, and the Tesla man himself may want to take a few notes. Check out some of Bored Elon Musk's most inventive life hacks below, and vote for the ones you wish you had thought of first. Hans' tip: use an email program that allows you do delete attachments. Delete all attachments before moving the emails to folders, and of course save it before if you actually need it. My business and private email history from 1999 on thereby is a mere 3 GiB, and these are hundreds of thousands of messages. I think this makes fun of how nobody uses QR codes. An app called "one more?" Is available and doing this since 2013. Developed by MDs. This is called lamps. Available in stores neaby. Or just makes a list and reports once weekly and allows you to select what you do and don't want to see anymore. Much needed! Especially on my mom's cell phone! Well, smart TVs already have face recognition features, so I see that as a possible thing to happen. This is a great idea. E-wallets should be able to give an alert when synced with gps when you're in a store! This would be very good for working morale! And for United Airlines it can be slightly modified to the hand does not have a tipping finger but forms a fist for punching. I have the bags in my car, but I keep forgetting to go to the grocery store. American bananas are awful enough, do you have to try to make them even worse? The door of the apartment where I currently live is operated by a password. Or a numeric code, if you will. Just your bedroom, including closet; and your bathroom. looks foreign to me, must belong to Apple. Man then im going to get the strongest coffe ever!! I have a loud motorcycle, it's cool. Easy fix: just fold over the end after you tear it! Then you can just feel the roll next time. I'd be so scared that it would sell all the useless stuff I needed! Thats a damn nice idea. Those easy lift mattresses already exist, just need to install a wooden board under them and that's almost it already! Google town plus date will usually do. My teacher had to fix the date on my homework, because I wrote 3/21/16 . I did the homework on 3/21/17. Locally, Google Maps does this for the hospitals. All our local hospitals have internal maps that work with all android phones so you don't get lost in the hospital. Even has the individual floors mapped out by GPS detected altitude and elevation differences..
As a short person, I need this because the sun is aoften too low for the visor to be of any use. i dont want my fridge to judge me...not a good idea. I think the video automatically does that.